Version 0.3 Copyright (c) 2006-2012 Regis Cosnier, All Rights Reserved. according to the terms of the GNU General Public License (GPL). or the open source ffdshow codec and the AC3 Filter. Copyright (c) 2006-2012 Regis COSNIER, All Rights Reserved. according to the terms of the GNU General Public License (GPL) version 2. Bonjour Regis. Je n'arrive pas à faire marcher CodeTV avec l'usb TeVii sous Windows 7. J'ai rajouté Low et High oscillateur. Apparemment le niveau de réception indiqué par le programme est bon mais l'écran reste noir. J'ai sauvegardé le Graph et le Network Provider n'est pas connecté ! Merci d'aider un vieux bonhomme (77 ans). Cordialement. Hello! first of all congratulations, Nice Job! We are using your program for some time, and all works ok, but now with some channel sometimes and exception is throwed and the program finish, "spatial scalabitiy not supported". How we can manage this error? Maybe the codecs Or how we can catch the exception? Thanks in adavance. I know this application is not very user friendly. But the README file explains some tips to fill the parameters. But the most important parameters are the devices parameters: - The must have are "Tuner Device" and "Capture Device". - Then if it's not enough, you can specify the other devices: video/audio decoder/renderer. If there is no codec in your system, download FFDSHOW! - The other tuner parameters should be discovered automatically (at least for DVB-T). Hello, Is epg support for dvb-t planned? hi i work with your software . very very thanks . it is a goods application . but for DVB-T , i doesn't work audio . i download Cyberlink codec and fddshow codec .but audio doesn't work ? what is it ? i have skystar usb 2 external card but i do not see any capture device in programm . my card is installed and progdvb works fine please help me. Bonjour, je cherchais un parser pour les tables des flux DVB pour un programme en GPL, je crois que je l'ai trouvé ;-) A première vu, il manque le LCN, la video H264, l'audio EAC3 et AAC, l' original_network_id, mais je pense pouvoir les ajouter. Merci ! Bonjour Pseudoz et Herve, Je vois que cela intéresse du monde. Il n'y a pas de nouveauté car j'ai fini par acheter une télé :-), donc je ne l'utilise plus... Je vais surement faire un repository sous Github. Ce sera surement plus simple pour partager le code. Does this software work with Brazil Digital TV? I too have tried with DVB-S Tuner. There needs to be a place to enter values for the Local Oscillator(s), not built into the source as there are different values for different equipment. @More2Read You are right, it seems there is more parameters to tune a DVB-S channel. But without the hardware, I cannot test. If you are able to modify the source code at GraphBuilderBDA.SubmitTuneRequest() around the line 400, it might be possible to make it work. I will be happy to integrate this working feature in CodeTV! Here is where I got inspiration from.... vidplaycorder.googlecode.com/svn-history/r13/trunk/sources/Samples/BDA/DTVViewer/ I believe it's a different Code language, but shows what is needed. @More2Read The sample DTVViewer does not seems to be very advance. Not sure it actually work. The open source project http://team-mediaportal.com/ is a big gas factory, but you can look for IDVBSTuningSpace in their source code to get some inspiration. I hope it will help you. I got it to Lock a Transponder today, but no video or Audio. The Infos - Transponder is populated, and looks correct. However, when I use Graphedit to Connect to Running Graph, is populates correctly, but no PID Mappings in the MPEG2 Demux. I see that you are manually setting the MPEG2 Demux Output Pins. Any way to use Generic Demux, and let it auto populate? False hope. It looks like it is using a previously locked Transponder. Back to the drawing board. @More2Read This looks promising. Actually, I get the PIDs when I scan and create the channels. To manually get these PIDs once you lock a transponder, just open the "Channel Infos" panel from the "Window" menu. And If you click on the "Transponder" or "Channel Infos", you can see all the needed data with the PIDs of all the channels in a transponder. And in the "Channel Properties" panel, you can set the Audio and Video Pids, and then click on the "Test" button to map the pids in the MPEG2 Demux (I'm not aware of a Generic Demux). Don't hesitate to change the Audio and Video Decoder Device to either "Microsoft DTV-DVD..." or "ffdshow...". The generic Network Provider shows in Graphedit as "Microsoft Network Provider". It only become functional when a Tuner is attached, you can then enter Transponder information, and select Submit Request. CoLoRs! 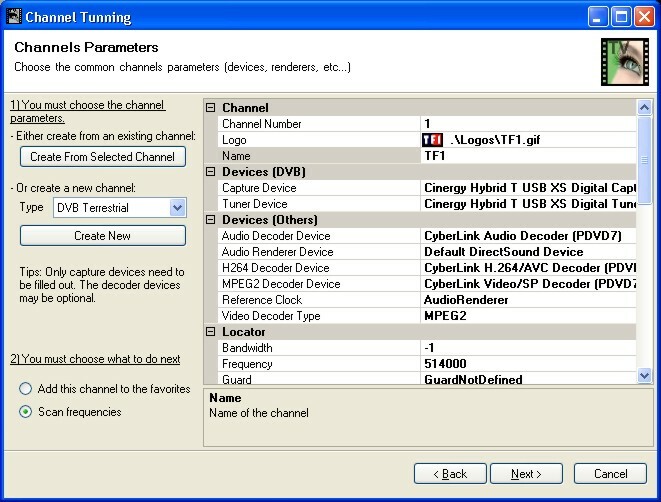 :) I can not tune from CodeTV, but if I lock a signal in TrandEdit, then CodeTV will Lock the Transponder. Then I entered the SID, and colors appeared. Now for the though question.... I need to use "Reclock" for audio bitstreaming, but it does not appear in the CodeTV Audio Codec menu. Hmmm.... I downloaded your 32 bit version, but my h264 (Lav Filters & ffdshow) codecs do not work when I have "H264" selected in the Channel Property for "Video Decode" - But "Reclock" does show. Bonjour Régis, Pour diverses raisons, je n'ai pas touché à mon code depuis plus d'un mois, mais je viens de voir que tu as bien bossé pendant ce temps ! Une petite question : Serait-il possible de migrer tout ou partie de Channels.cs vers PSI.dll ? Je n'ai jamais travaillé avec des PropertyGrid et je ne sais pas si c'est facilement faisable ! Sinon, j'ai fait une macro Excel pour faire un fichier .VB ou .CS à partir du fichier téléchargeable ici : http://www.dvbservices.com/identifiers/original_network_id&tab=table?page=1. C'est juste pour avoir un "Friendly Name" de l'ONID sur mon interface. Et c'est sympa pour les frontaliers. Tu es intéressé ? Je vais essayé de tester/comprendre le code de la version 0.3 d'ici la fin de l'année. Très cordialement, Hervé. Hi Thank you for this great application! I have problems with sound. Video capture works perfect. Capture device and tuner device: PCTV 291e/461e USB 28179 Device Audio decoder: ffdshow Audio Decoder Audio decoder type: AC3 I also tried with Microsoft DTV-DVD Audio Decoder and MPEG2 and a lot of combinations. Audio Render: DirectSound: Philips 244E-3 (NVIDIA High Definition Audio) Is there anything I can check or do to test it or get the sound to work? The application that came with the tuner has audio. @Michael It is very difficult to say from here, but you could try to launch the small free tools "GraphEdit" (x64 or x86 following "CodeTV.exe" or "CodeTV x86.exe"). And "Connect to Remote Graph..." with CodeTV tuned on a TV channel. It could give some information on the connected codecs. May be the audio codec could not connect or something else! Hi, i haven't tested the application yet, but can one specify directshow filters, 3rd party ones? I have an ati tv wonder pro pci card by the way and i would like to use with this app. Hi Reggie, CodeTV may work only with third party codecs. There are two main codecs (filters): * Digital tv (DVB-T) device with BDA drivers which provide the source codecs * Mpeg2 / Mpeg4 codecs If the ati tv wonder pro pci card comes with the BDA drivers for digital tv (CodeTV support DVB-T and not ATSC), it should be possible to use it. CodeTV may work with analogical webcam but not with the analogical TV :-( I still use CodeTV from time to time, but I do not develop it for a long time. Sorry. I let the source code public, and may be, I will update it in the future. @Rayed Sorry, it only supported the Microsoft dvr-ms format! Hi Regis. Does this software works with DTMB too? @BlueSky Sorry, but I don't think that aes128 is supported. Or, may be through third party codecs? thank you I want change your code to do this job where i can get mpeg raw data and then change it? Page size about 45487 octets. Server generation in 0.028 seconds. Client load in seconds.